An ovular, versatile nut that provides a good source of protein and also contains fiber. Almonds make a crunchy, healthy snack and are often used to make a variety of desserts, salads and candies. They are used in marzipan, nougat, and many pastries. The young fruit of the almond tree is sometimes eaten whole when they are still green, before the inner shell has hardened ("green almonds"). Almonds contain almost no carbohydrates and are also gluten-free. They are also a rich source of Vitamin E and monounsaturated fat. Almonds are used in Mogul style cooking in Northern India. Almonds are used in both sweet and savory dishes in India. Also used to thicken sauces and as a special garnish. Choosing: Almonds that are still in their shells have the longest shelf life. If purchasing these, look for shells that are not split, moldy or stained. Shelled almonds that are stored in an hermetically sealed container will last longer than those that are sold in bulk bins since they are less exposed to heat, air and humidity. If purchasing almonds in bulk bins, make sure that the store has a quick turnover of inventory and that the bulk containers are sealed well in order to ensure maximum freshness. 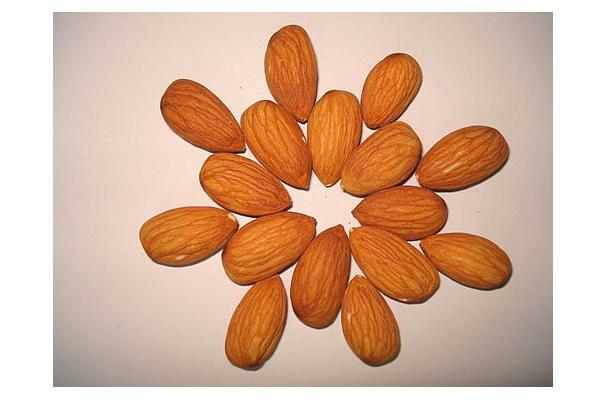 Look for almonds that are uniform in color and not limp or shriveled. In addition, smell the almonds. They should smell sweet and nutty; if their odor is sharp or bitter, they are rancid. Buying: You can buy almonds at your nearest grocery store. If you want to remove the almonds' skin, blanch them for a few of minutes until you notice the skin beginning to swell. Drain them and then rinse under cold water. Pinch the cooled almonds between your thumb and index finger, and the skin should slide right off the almond meat. To roast almonds at home, do so gently--in a 160-170°F (about 75°C) oven for 15-20 minutes--to preserve the healthy oils. For more on the effect of high heat roasting on nuts, please see the following article. Global production of almonds is around 1.7 million tonnes, with a low of 1 million tonnes in 1995 and a peak of 1.85 million tonnes in 2002 according to Food and Agriculture Organization (FAO) figures; world production of almonds was 1.76 million tonnes in 2006. According to the FAO, major producers are the USA (715623 t, 41%), Spain (220000 t, 13%), Syria (119648 t, 7%), Italy (112796 t, 6%), Iran (108677 t, 6%) and Morocco (83000 t, 5%). Algeria, Tunisia and Greece each account for 3%, Turkey, Lebanon and China each account for 2%. In Turkey, most of the production comes from the Datça Peninsula. In Spain, numerous commercial cultivars of sweet almond are produced, most notably the Jordan almond (imported from Málaga) and the Valencia almond. In the United States, production is concentrated in California, with almonds being California's third leading agricultural product and its top agricultural export in 2008. California produces 80% of the world’s almonds and 100% of the U.S. commercial supply. California exported almonds valued at 1.08 billion dollars in 2003, about 70% of total California almond crop. History: The almond is a native to the Mediterranean climate region of the Middle East, eastward as far as the Indus. It was spread by humans in ancient times along the shores of the Mediterranean into northern Africa and southern Europe and more recently transported to other parts of the world, notably California, United States.